After a few games, you may want to take a new challenge with the Expert Mode. This variant is reserved to players who master the Classic mode and want to add a new twist to their games. It also lasts longer as you will play 5 rounds instead of 4. The paragraphs below explain the different set up and gameplay modifications. Use your Player Mat on its Expert side. 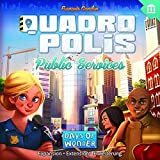 The city is composed of 5 Districts, each with a different background. 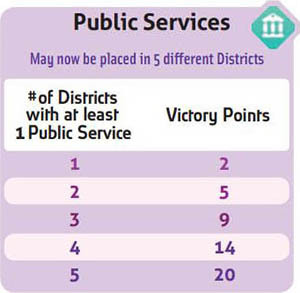 Each District has a specific number and is divided into 4 squares, that also have a number on each one of them. or on an empty square in the District whose number matches the number of the Architect you played. Players play from a common pool of Architects. Turn the Architects on their gray-colored side, add the Architects #5 to the pool and place them next to the Construction Site. 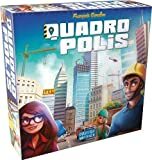 There must be one Architect of each number per player (for instance, with 2 players, use 2 Architects #1, 2 Architects #2, etc).. All unused Architects are put back in the box. Architects do not belong to any player. On your turn, simply take one Architect among those available to play. 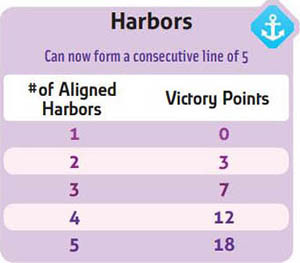 In the same round, you may play several Architects with the same number if your opponents don't take them. Important: As in the Classic Mode, there are 4 turns each round. This means that all Architects will not be used: at the end of the round, there will be as many Architects remaining as the number of players. At the end of each round, all Architects are placed back in the pool for the next round, next to the Construction Site. Two new types of Buildings come into play. Replace the Buildings that have a "Classic" back with the Buildings with an "Expert" back. 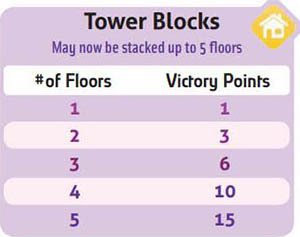 Office Towers score VPs depending on their height and when adjacent to each other. Mary has three adjacent Office Towers. As a result, she needs to check the third line of the table to calculate her score. 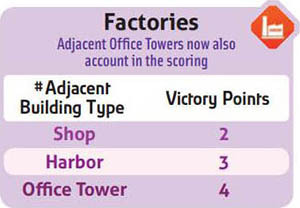 Two of the Office Towers have 2 floors and score 5 VPs each, while the third one has 3 floors and score 9 VPs. 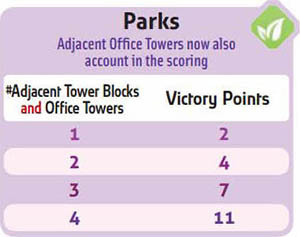 The final score for Mary's Office Towers is 19 VPs (5+5+9). 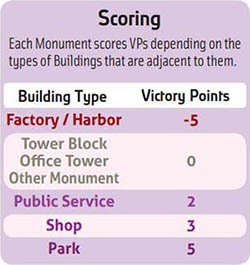 Monuments score VPs when adjacent to specific Buildings. 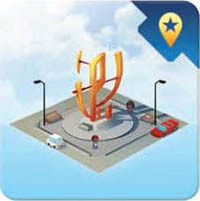 There are as many Monuments in play as there are players. There is 1 Monument per round except in the first round (2-player games: no monument in rounds #1, #4 and #5; 3-player games: no monument in rounds #1 and #5). 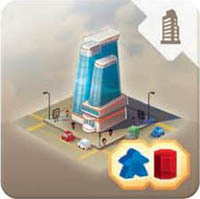 Buildings are scored as in the Classic Mode. 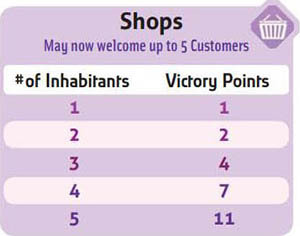 However, because the players' cities are larger and because of the addition of Architects #5, Tower Blocks, Public Services and Harbors may score more VPs than in the Classic Mode, Shops may welcome more Customers; Parks and Factories also interact with the new Office Tower Buildings.